The service which would actually be operated is something of a moving target, but in order to model the system, one must create a pro forma plan. This immediately gets Metrolinx into trouble because SmartTrack is not simply an upgrade of GO’s service, but a very political entity with already-promised levels of service and the associated capacity for new ridership. The expected service levels have already been incorporated in the City of Toronto’s proposed agreement with Metrolinx, and there is a mismatch for the eastern part of the SmartTrack corridor. This, in turn, affects the claimed level of service in Scarborough versus existing transit services and the planned Scarborough Subway. Stouffville corridor: All-stop peak direction outer service between Lincolnville and Unionville stations; trains will also stop at Kennedy and East Harbour stations, otherwise, express to Union Station. Inner services will stop at all stations between Unionville and Union Station. This scheme produces varying service levels at the GO and SmartTrack stations, but these are not supposed to be definitive. The modelling assumptions in Table 1 of the Appendix do not represent a service plan. The full service plan for GO Expansion will be defined by bidders as part of the procurement process, described below. On April 3, 2018, Infrastructure Ontario and Metrolinx also issued a Request for Qualifications for the GO Expansion project2. The RFQ is the first step in the procurement process to select a team to deliver GO Expansion, including design, build, finance, operate, and maintain. The project is being delivered as a Design Build Finance Operate Maintain (DBFOM) contract using Infrastructure Ontario’s Alternative Financing and Procurement (AFP) model. A key feature of this choice of procurement method is that bidders will be responsible for planning, designing, building, and operating the train services that are required to meet Metrolinx defined output requirements. In other words, we really don’t know what service will be offered to “meet the mandated requirements”, or even what those requirements are. 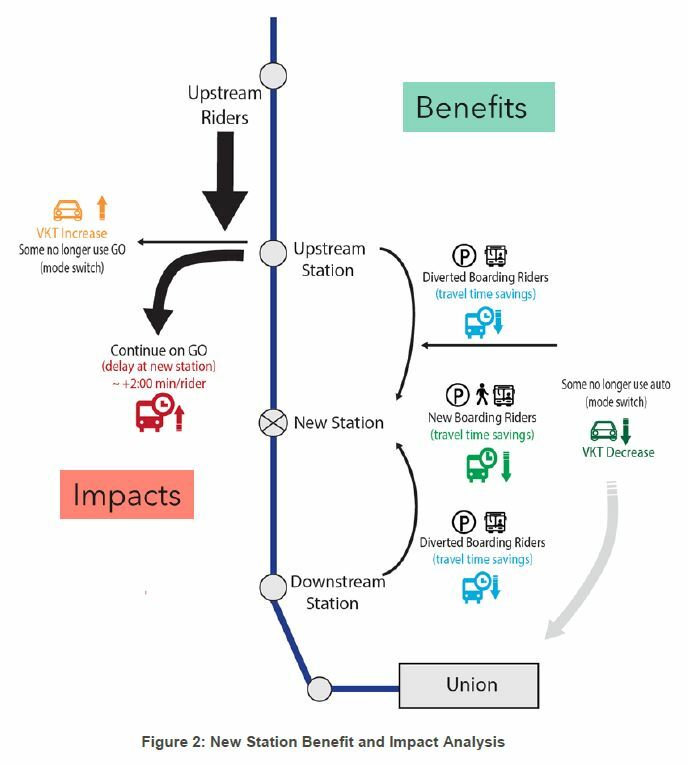 A basic problem faced by any bidder is that the infrastructure is already in place, or at least designed, based on the service plan GO had intended a few years ago. Moreover, earlier reports were quite clear in rejecting express services because of the infrastructure requirements. The table below compares the service levels used in this report with those in the City of Toronto’s SmartTrack report. “Fare integration” is also assumed, but for purposes of modelling, this does not mean GO/ST services as a part of the existing TTC tariff, but only that the fare to switch between the two networks would include no barrier, no disincentive. Whether TTC base fares would have to rise to make this possible is not part of the discussion. Basically, the fare component of trip choices within the model is simply “turned off”. This, of course, does not match the current arrangement with co-fares and discounts. Park-and-Ride remains an important part of the Metrolinx model because it is the only way that many would-be riders can actually reach a station. This produces intriguing effects as we will see shortly. The ridership projections are shown in two tables which are consolidated for convenience below. The set of numbers on the left is taken from Table 5 [p. 20] which gives the projected boardings (ons) and alightings (offs) for each station, as well as the all day total. The AM peak total shown here is simply the sum of the ons and off. The ratio shows the factor Metrolinx used to scale up modelled AM peak numbers to all day numbers. The set of numbers on the right is derived from Table 4 [p. 19] which shows the gross count of new GO trips, and the net value when riders lost to other travel are removed. The “Diverted” riders are those who formerly used another station (i.e. they are existing GO users) but shifted to the new stations. (This is the total riders less the new riders.) Finally, the “Lost” riders shows the difference between the gross and net new riders values. In all of the numbers above, remember that “All Day” figures include the return trips and so the number of people represented is roughly half of the number of trips shown. A few stations, East Harbour and Spadina/Front, are destination stations serving major employment areas. They originate fewer AM peak trips, proportionately, than stations that draw from residential areas. King/Liberty is half-and-half being both a major residential and job node. The daily:peak ratio reflects the use of different factors to scale up the AM peak model numbers based on anticipated ridership patterns. GO Transit is primarily a peak period service, and so relatively little demand occurs in the off-peak. However, a higher factor reflecting TTC patterns was used for stations within Toronto. For most stations an AM peak to daily factor of 2.8-2.9 has been adopted which reflects existing patterns on the GO rail network, specifically the Lakeshore corridors which currently have 30-minute all-day service. Whether this assumption is uniformly valid depends on the nature of each station’s catchment area and the type of traffic it will attract. It is not clear that a service operating every 15 minutes in the off peak will be able to attract a TTC level of off peak demand relative to the peak, and so the all day numbers could be overstated here if the actual performance is more in the GO Transit range. The Lawrence/Kennedy station shows an all-day demand of 9,200 riders compared with existing SRT usage of 7,850 [see TTC station usage counts for 2016]. Given that the bus-to-train connection will be considerably less convenient for the new station, and that the SmartTrack trains will stop only 4 times/hour, it is extremely difficult to believe that today’s level of demand will be sustained if riders have the option of taking a bus to a subway station. Kirby station, one that had originally been discarded by Metrolinx as not worth the effort, now is the origin of more trips than any other new station. The number of 3,800 is simply not credible. The preliminary business case states that two thirds of this demand is expected to be Park-and-Ride, and this would mean about 2,500 riders would arrive by car and park for their morning commute. This would require a massive new parking facility for about 2,000 cars. In other words, Kirby doesn’t work as a station unless it is force-fed by pulling car commuters (many of whom now use adjacent stations) to this site. This is a classic planning gerrymander. The report does not give any information about the forecast demand at existing stations notably Unionville, Milliken, Agincourt, Kennedy, Main, Union, Bloor and Weston all of which lie on the SmartTrack corridor. Similarly there are no data for the GO stations beyond the ST area that would be affected by new service patterns and additional nearby stations. Moreover, there is no projection of on train accumulated demand to verify that the service plan and the projected ridership actually fit together. I intend to request the ridership projection details for all stations from Metrolinx. A technical briefing doc will be shared in the coming weeks that you’ll be able to trash thoroughly. I do not intend to “trash” any document, but to provide analysis and criticism, something to which Metrolinx is particularly averse, especially when politically sensitive issues are at stake. Metrolinx has been quite adamant in its opposition to a station at Park Lawn, and has relented only to the degree that a split service with Mimico, each station getting a train every 30 minutes, is now proposed. The demand projection for Park Lawn suggests that it will be quite popular. The fact that the net number is quite low indicated that most of the new riders attracted to Park Lawn would have used Mimico absent a Park Lawn station. Because Metrolinx has not published a projection for the Mimico station, we do not know how much of its demand would shift east to Park Lawn. The total daily demand at Park Lawn (10,000) is roughly the same number as the infamous Kirby station (10,600) which gets by only by dint of a massive parking facility. Similarly, Lawrence East (9,200) rates a station, and like Kirby would see 4 trains/hour. Park Lawn gets only 2. There are riders today at Park Lawn and at Lawrence East while Kirby is an empty field. It is difficult to accept that Kirby makes sense and Park Lawn does not, but then I’m not the Minister of Transportation plunking down a station where it suits me. This entry was posted in A Grand Plan, Commuter Rail, SmartTrack, Transit. Bookmark the permalink. ← Who Will Pay For SmartTrack? Steve: More to the point, even a knowledgeable in-house blogger would not be able to speak truth to power. The Lawrence/Kennedy station shows an all-day demand of 9,200 riders compared with existing SRT usage of 7,850. Given that the bus-to-train connection will be considerably less convenient for the new station, and that the SmartTrack trains will stop only 4 times/hour, it is extremely difficult to believe that today’s level of demand will be sustained if riders have the option of taking a bus to a subway station. This is worth repeating and I totally agree. Due to budget limitations, they did not offer a suitable design of Lawrence Station. The SRT at 7,850 usage is with 4-5 minute service. There is absolutely no logic to reducing to 15 minute service and expect ridership to rise to 9,200. Kirby certainly has a stench, but, given the rapid development of that area of Vaughan, and the current lack of non plugged roads to Toronto, I can see a great deal of virgin traffic descending on Kirby in less than a decade. These people will simply have no alternative. I’m not at all sure that any of this will be viewed as a good thing in 2030, but no one has the guts to address the many problems of GTA development. Is it any wonder that the Public is so cynically dismayed at how GO is delivered? I have a relative who is a civil engineer, and in a recent conversation with her I learned she has been working as a site contractor on things related to one of the GO rail corridor widening projects. As a casual enthusiast of such things, I’ve tried to stay informed about the goings on by reading whatever technical backgrounders GO/Metrolinx posts online and by tracking the news, but I certainly wouldn’t call myself an serious expert by any means. However, after hearing me speak about my fairly detailed knowledge of the scope of the various projects currently under way, she said it appeared I knew far more about all the plans than even she did! If Metrolinx feels they are getting “trashed”, they’ve certainly invited it upon themselves with their smugness and arrogance. It feels like the ‘sporting’ thing to do! So does this mean the plan is to run local GO/Smarttrack trains every 10 minutes on the Weston corridor in addition to the UPX and (presumably) express trains to/from points beyond Bramalea? Also, is the lack of reference to Mount Dennis station an oversight, or is the service plan different? Steve: There has to be a Mount Dennis station to connect with the Eglinton corridor, and I suspect that they have not yet decided on the fate of Weston Station once the corridor gains another stop 2km further south. This would be similar to the Park Lawn/Mimico debate. They still need to figure out a way to include the proposed Spadina-Front stop as a Smart Track local station. It needs to be served by trains that run through Union Station and not isolated as part of Barrie line only. Steve: This won’t happen because of track geometry. The Barrie line is the northernmost/easternmost of the lines feeding into Union from the west. At one point, the proposed Spadina station was thought of as linking to the Relief Line as a downtown distribution subway, but with the RL up on Queen now, that is not happening. Also, the Spadina station will be a through station rather than a terminal with trains continuing into Union. If SmartTrack went to Spadina station, it would be in the wrong part of the corridor for through routing to Weston. I understand the track geometry issue. But Spadina-Front can be vital local station to the city that can serve the many new developments in the area including Rogers centre and the future rail deck park. To isolate this station only to Barrie line commuters makes little sense. It needs to be served by Smart Track line therefore giving riders a direct path from both sides of the city with through service beyond Union and at same time allow commuters who work near Spadina a better option then getting off at an already congested Union Station and walking west. Steve: I agree, but it is unclear what east end service the Barrie line might be hooked up with. I think that focusing on SmartTrack itself ties us down too much to that specific proposal rather than looking at the GO network as a whole. The Stouffville/Weston pairing is left over from the original scheme for a Milton to Unionville service that evolved into SmartTrack. Unnamed Gentleman: A technical briefing doc will be shared in the coming weeks that you’ll be able to trash thoroughly. I agree with the gentleman. Trashing is all that Steve and his followers have been doing. I will give you one example of your trashing out of countless. For example: You and your followers have already dismissed hydrogen technology even though that none of you even have the expertise to do so. For God’s sake, please let the experts and our democratically elected leaders make the decisions rather than trashing them all without even having the expertise to do so. Steve: From what I have heard, the experts at Metrolinx think that Hydrogen is a total crock, and the only reason they are studying it is because of political pressure. There is extensive criticism of the claims made for this technology available including in some of Metrolinx’ own background studies, presumably by the very experts you want to hear from. And, by the way, some of the people who leave comments here are rather well-informed but do not leave their names for rather obvious professional reasons. As for your post under a pseudonym, I assume you have a valuable reputation to protect, and would not want the world to know what a fool you really are. And anyone who sends email like that is no “gentleman”, certainly not a “professional”. Where to start? Probably with thanks to Steve and the commenters of all backgrounds and knowledge/experiences, including those on the dismissive side, as I’m sure they represent a portion of the population/votorists. With the mathemagics of the Smart Trick, if we were less committed to a boondoggle in the east,and were willing to charge the cars appropriately (how about to same level as user fees for the transit? ), then we might have an ability to avoid the major risks of the TIF, based on it is on a presumption of an ongoing boom which is showing signs of popping, or is at least on the fragile side. The Star had an editorial yesterday; making up for Exec. I’m hoping that maybe people/GO users of 905 will be more alert to how it seems this ST stuff is diluting the more regional carrier to a local service in the TO core to make up for the many decades of civic sloth/inability/stupidity in providing robust transit, particularly in the core. And why not build up the TTC from being a milk run only to a more robust semi-regional/express role? I’d focus on the numbers and obvious corridors where there are clear demands unmet for a long time eg. King/Queen and the east-west travel demand including Gardiner/Lakeshore. There’s been near-zero interest of a reversible transitway aligned with much of the 1985 DRL and using Front St. as a core corridor, and it may be largely built shut as gee, how did all those new buildings emerge, and if we don’t plan transit, then we get buildings, and is this why Mike and Gord support a new road exactly where the DRL was supposed to go? There’s another less-good chance to improve the Queensway car/service in to core and that is to divert some of this service along on the north side of the Weston tracks to Front St. and then use that graded remnant of the Lands and Gardens Trust starting at Bathurst and going up to Spadina grade for transit. But odds are now high that oh, plans are all set for the RER and only GO to use any extra land – but why not double-stack the transit? Put a tunnel for TTC usage below any GO starting at Queen and Dufferin and leading to the Front/Bathurst area? Yes it would cost; are we overdue for some real transit? And if it is too much, how about starting off with a diversion but instead of following that alignment on the north side of the tracks, send the tunnel to south side of tracks to enable a lot more of Liberty Village usage and then cross over tracks again – somehow – somewhere – near to Bathurst or Strachan. I haven’t gone and looked at it all, or even looked at a map, but if we had real planning (why can’t we cough up a few millions to APTA/UITP for their services? ), we’d see the overload of existing lines and the gap in services etc. And rather than limit development until we actually have real transit improvements, what about charging cars appropriately and putting those proceeds to transit change? A Vehicle tax is a real option, but not with the suburban-dominated Clowncil who are prepared to sewer all of us for a few pet projects that aren’t as sensible, though we need transit. And if we do a DRL, the Queen St. alignment is wrong, at least in centre of City. Ed Levy’s book has a recent plan from the TTC showing King as being their preferred option. Steve: The DRL is on Queen to avoid competing with SmartTrack, one version of which included a tunnel under Wellington. At the risk of asking a question that has no answer, and trying to find sense where there is none to be found… where is the logic behind leaving Weston and Etobicoke North GO stations out of the SmartTrack concept? I understand the original idea was to build the heavy rail spur on Eglinton West out towards the airport, but now that that idea is long gone, and the Eglinton West LRT is effectively a completely separate transit line, why does the City continue to pretend like “SmartTrack” won’t also serve the two remaining GO stations in the 416 on the Kitchener line? I suppose the same question could be asked of stations like Unionville, Malton and Bramalea given that these are within Metrolinx’s proposed “local” corridor as well, but given that they’re outside of the 416 it is at least plausible that they might be subject to a different fare. It would make zero sense, though, to hive off Weston and Etobicoke North stations and subject those riders to a different fare (especially considering the demographics of the communities around those stations). Why the City wouldn’t just roll those two stations into the overall concept (and take the credit for it as well) is beyond me. Steve: The original version of what became SmartTrack was proposed to run from Unionville to Milton (via the CP corridor) and didn’t even get to Weston. This proved impractical, and so it was shifted north to Eglinton where a heavy rail line (!!!) would have operated out to the office district south of the airport. I am not making this up. The consultant who cooked this up (who is now working for Metrolinx by the way) “surveyed” the line from out of date Google Street View photos. SmartTrack as a brand never ran further north although the trains which will provide this service will operate as far as Bramalea. It really is too much to ask the Mayor and his boffins to sort out a realistic description of “SmartTrack”. Metrolinx laughs at it privately, but publicly must be seen to be supporting Tory. Who came up with a schedule that has two services on the same corridor that have frequencies that are mutually prime numbers? Stouffville would have one service every 15 minutes and another that is every 8.5 minutes. That will make a really easy schedule to build if one service has to pass another and they use some stations in common. Lakeshore east would have one service every 7.5 minutes and the other every 5.5. Please tell me that the Stouffville trains are not part of the8 and 15 on the Lakeshore east because that would be totally asinine. I don’t think that they have anyone in their planning department who has ever worked on building a real schedule. Steve: Their study claims to have used graphic timetables, but that was when they wanted to prove express trains would require more tracks. Now that the official story is that express trains are good, there is no explanation of how they would work, let alone the behaviour of the headways. Strangely there has been some essential points made here, that do trash this technology based both on a level of understanding that is more than adequate to see the issues, and the reality that it is being pushed in an area where it makes little sense first. 1. Bottom line, the current level of technology means you have to transport a large volume of fuel of a low energy density, which requires either high pressure, or massive volume of tank, (this flowing directly from the reality that it yields a limited amount of energy and pv=nrt is a truth that is not easily escaped when dealing with a gas, and to reduce hydrogen to a liquid is prohibitive, and to have a media that absorbs it, means media weight). While hydrogen has a higher energy by mass (3 times diesel) the issue is not mass, but volume, hence weight of storage vessel, or media. 2. The reality is you are using hydrogen to create electricity, which begs the question, why not eliminate the issue of transporting the hydrogen entirely – and if you want to use hydrogen tech, why not place it rail side, providing power to the electrified line, hence making it a stationary storage issue. 3. The best argument for using hydrogen in terms of environment is to displace other fuels, but if you are getting it from natural gas, you are still emitting the vast majority of that carbon when you crack the methane to get there. The alternative is to generate hydrogen using electrolysis, which is essentially really dealing with the issue of smoothing the problems of timing of electrical generation versus consumption, which environmentally is a very valid point, and remarkably useful. However, again, why push the issue of transporting hydrogen, when it can be used more broadly to smooth the grid, and this would be a far easier point of introduction for the technology. Why start with mixing it in transportation, when the technology has better application, that does not have the same number of hurdles to clear. The proposed electrification of rail is a narrow application. This very likely to be another area, where there will be no first mover advantage, and 2nd or 3rd mover will be much better placed – so why get in on the first gen? Why not look to start with the more mature in grid technology? Use it to address the real issues in the grid – distribution and timing – because we pay for wind, and solar, even if we are dumping the power, or paying for non production. However, should this be something that gets mixed into transportation and force fed, especially when this makes the development that much harder? Should we be looking at hydrogen where it applies, sure – but would that not be better with using electrolysis, in local application, where expensive grid additions will be required, and based on using electricity we are paying for anyway? That is smaller, stationary, and fixing other issues. PS: Public transit in Ontario has a very bad history of trying to mix in other policy, in a half baked way. This would appear to be another such example. Lower capacity, more localized and stationary use would likely provide some real options, where there has already been decades of use technologically, and using things that are much closer to mature. The grid itself has some very specific, local issues, it has a very substantial timing issue in terms of generation, that makes green technologies we have elected to use (wind and solar) less competitive (as opposed to bio gas) where hydrogen likely has meaningful application at the substation level (boosting local power availability – where expensive increases in lines and such would otherwise be required). It is not the issue of hydrogen per se, that bothers me – it is the forcing it into a much harder space. Steve: The fundamental problem here is that hydrogen advocates whispered in a Minister’s ear, and the Liberals (like the Tories and the NDP) just love an “industrial development ” strategy especially if it is “green”. Whether ir is workable or economic for the proposed application has nothing to do with it. Metrolinx claims that it is leaving the technology choice in the hands of the DMFOM bidder for the RER network, but if you believe that, I have several slightly used bridges for sale. A bidder will do anything for a price, but they will probably want supply guarantees and some sort of indemnification against various cost and reliability pressures. If we’re lucky, this idea will die off, but we might lose electrification completely given the state of power system politics in Ontario.